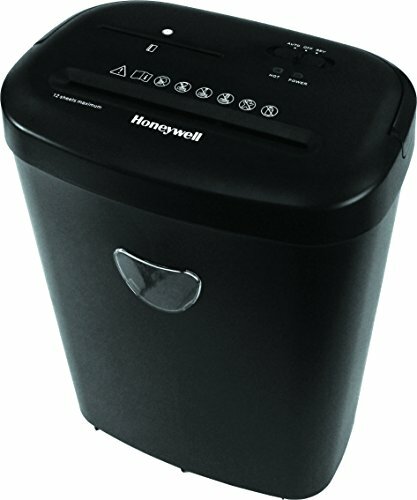 The Honeywell 9312DS model 12 sheet cross-cut paper shredder with CD slot has the capability to shred paper, credit cards, staples, and CDs. The 3 function control switch features an auto start and stop, manual reverse, and a manual shut off. This Honeywell shredder has a cycle time of 3 minutes on and 45 minutes off, overheat protection, and a top handle for easy emptying. The waste bin has a 6.6 gallon capacity and a transparent window to easily monitor the fullness of the bin. This shredder has a paper feed opening of 8.7 inches and shreds paper into 0.20 inch x 1.5 inch sized pieces. The Honeywell 9312DS is UL approved and is backed by a 1 year cutter and labor warranty and a 3 year warranty for parts. If you have any questions about this product by Honeywell Safes & Door Locks, contact us by completing and submitting the form below. If you are looking for a specif part number, please include it with your message.